This article is about Master Hand's appearance in Super Smash Bros. Ultimate. For general information, see Master Hand. Master Hand returns in Super Smash Bros. Ultimate, playing a role in Classic Mode and Adventure Mode: World of Light. Master Hand appears as a boss in Classic Mode. 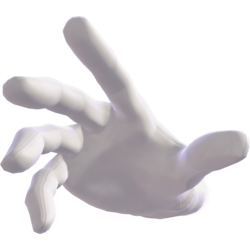 For the first time since the original Super Smash Bros., Master Hand has the ability to face in either direction (left or right), which he combines with snapping his fingers to teleport around. Also for the first time in the series since Brawl's Boss Battles, Master Hand no longer has a stamina HP indicator, instead having a health bar akin to bosses from Subspace Emissary or World of Light. This results in Crazy Hand having a separate health bar as well, meaning that they no longer share the same pool of HP as they did in Smash 4. However, he can now be stunned, which renders him immobile on the ground for about 8 seconds. All the Fighters, with the exception of Mario, Link, Yoshi, Kirby, Luigi, Captain Falcon, Bowser, Zelda, Marth, Young Link, Dark Pit, Snake, R.O.B, Toon Link, Wolf, Mega Man, Rosalina & Luma, Pac-Man, Duck Hunt, Bayonetta, Inkling, Simon, Richter, King K. Rool and Piranha Plant, fight Master Hand at the end of their route. Falco and Ken only fight Master Hand along with Crazy Hand if the intensity is 7.0 or above. Some fighters like Pikachu first fought Mewtwo before Master Hand. All the fighters who fought Master Hand, except for Pikachu and Pokémon Trainer, fought both of Master and Crazy Hand if the intensity is 7.0 or above. Some like Diddy Kong or Ryu always fight both of the Hands. Master Hand has received the greatest overhaul of any incarnation, gaining a significantly larger moveset overall. Moves that can be used while Master Hand is playable in World of Light are marked based on their input. Big Swipe Side Attack 13.8 Master Hand makes a big open-hand swipe across the stage. Fake-Out Slap Down Attack 15.2 Master Hand holds a fist above the player as if to punch them, but instead opens up and comes down with a slap. Finger Bullet Neutral Special 12.4(one pair) 9.7(three) Master Hand fires pairs of bullets - one pair normally, or three at low health. These can be reflected. When controlling, holding Special fires more pairs of bullets, also up to three. Finger Drill Up Attack 45.2 Master Hand drops from above, spinning and drilling into the player. It buries the player if it connect dead-on, and also has a vacuum effect to pull the player in if they're barely out of range. Fireball Frenzy 14.5 Master Hand retreats into the background and produces between three and five fireballs, which he throws at the player. He then returns to the stage with a flying punch. Hazardous Smudge 14.8 Master Hand drags a finger over the floor, causing a string of damaging spikes to sprout in that location. If the player can get Master Hand to touch the spikes (by Finger Drill or Fake-Out Slap), he will become stunned. When fighting both Master Hand and Crazy Hand, the latter can also be stunned by getting him to touch the spikes (by Finger Drill, Spasm, or Spider Walk). Ink Blob 90.7 Master Hand creates a large ball of ink that covers both the player and the screen. The ink is an aqua colour that doesn't match any Inkling. Jetstream 13.7 Master Hand flies into the air and swoops in from the background. Laser Nail Down Special 6.4 Master Hand fires a blue laser from each fingertip. Mirrored Laser 31.1 Master Hand produces a series of mirrors and fires a single laser that bounces between them. Ring Toss Side Special 20.2 Master Hand throws two rings across the stage. They may or may not circle back around for another pass. Snapper Neutral Attack 11.1 Master Hand snaps his fingers, stunning the player. Spike Bowl Up Special 16.1 Master Hand underhands a series of spiked balls across the stage, which may either roll or bounce. They can be attacked, reflected, or even picked up with the right timing. Squeeze 19.4 Master Hand's pummel. Snap Teleport 0 Master Hand teleports by snapping his fingers. Shadow Puppet 25.8 The two hands form a canine-like shape and emit three damaging "barks", the third, much larger than the rest, causes the player character to get stunned if unblocked and within range. Zoom In 0 Master Hand and Crazy Hand create a "picture frame" (with their index fingers and thumbs), causing the screen to zoom in and flames to cover the corners in a similar vein to Sudden Death. During this time, the blast lines are closer, and the player can get KO'd much more easily. This effect is only temporary. In the mode's introductory cinematic, an army of many Master Hands is seen attacking the fighters alongside new foe Galeem. The Master Hands transform into glowing, energy-like forms which are absorbed by Galeem before it unleashes a blast of light that destroys the fighters. Master Hand can also be seen on the mode's overworld map, interfering with the player's path by creating force fields and destroying bridges. One is confronted before the player fights Galeem. After Galeem's initial defeat, Dharkon appears with his Crazy Hand army who begins to eradicate the Master Hands. When Galeem returns after the players initially defeat Dharkon, two more Master Hands are fought. Once the player manages to get the true ending's requirements, Master Hand and Crazy Hand are freed and they help the player by using their Static Discharge joint technique to create a giant rift in the map, which Master Hand enters, leading to the penultimate level where Master Hand himself is made into a playable character, engaging in a Mob Smash against 50 light and dark false characters. Master Hand's freedom suggests that, like the fighters, he was captured by Galeem before the events of World of Light and then cloned into controllable puppets. Master Hand's theme is mostly composed of the second and third verses of Lifelight, the main theme of Super Smash Bros. Ultimate. This is also shared with Galeem's theme. Master Hand, in the sole instance where he is playable, has 700 HP. This is the most HP he has in the series thus far, since he had merely 360 HP at maximum difficulty in Melee and Brawl. In the opening cinematic of Adventure Mode, Marth estimates that each fighter will need to take down about ten Master Hands, implying that there are around 740 Master Hands in Galeem's army. Master Hand's Mirrored Laser attack looks and acts very similarly to one of the attacks of the second form of Dark Mind, the final boss from Kirby & The Amazing Mirror, making this the second time his attacks takes inspiration from the Kirby series. Coincidentally, Master Hand appears in said game both as a miniboss and a boss alongside Crazy Hand. The battle with Master Hand can be softlocked by defeating him on the exact frame he is rendered invulnerable, causing him to be immortal and confuse the game to be in a fighting and victory state. Since blast zones are disabled, the player is able to fall indefinitely. Eventually, the player's character's y-axis position goes so high, it is rendered as negative, in which it distorts some of Master Hand's attacks such as the Ink Blob to be thrown upwards, his Finger Bullets angling downwards, homing attacks missing entirely, and his grab being performed immediately and also missing. Even more effects can occur, one of them being the Radar and Magnifying Glass showing inconsistencies of where the character is. This page was last edited on March 21, 2019, at 14:33.